After months of being sold out, the Nexus 4 finally went back this month. I'm sure you've already read my reasons for wanting one, so you won't be surprised that I wasted no time on placing an order. My Xperia S went up on eBay that same day and is now on its way to Canada. The new phone came a few days later and I've now been using it ever since. As such, I have a few impressions I thought I'd share. First off, it's big, but not huge. It's larger than the Xperia S, but not enough to be super noticeable. By today's standards, a phone with a 4.6" screen is average. I still think there's a place for smaller devices, but the Nexus 4 doesn't feel too big to me. It feels extremely nice. Everything about it feels like a premium, expensive product. The front glass is extremely smooth and seems resistant to fingerprints. It curves to the sides where it meets the chrome trim. The back is glass with that signature sparkle that's so often talked about. The sides are a soft-touch material, giving it a good grip. The glass back is SLIPPERY as heck. No joke, it will slide off any surface that's not perfectly level. I set it down on a closed laptop and it slid so slowly that I didn't even notice it was moving, but about two minute later, the phone landed on the floor. I hear the iPhone 4/4S has a similar problem with the slippery back, but this is my first experience with it. It's really bad. Shockingly bad. You simply cannot set the phone down unless it's on a perfectly level surface. No resting it on a couch arm, on the car seat next to you, on top of your wallet on a desk. You will need to either use a case or (like I did), get a screen protector set that includes a protector for the back glass. That solved the problem entirely. This phone is fast. Amazingly fast. Disgustingly fast. And it's not just the phone, but the network, too. This is one of the few phones that can take advantage of the full HSPA+42 that T-Mobile provides in most cities. The effect is that everything loads next to instantly. Anyone who's used a smartphone before knows the hesitation before doing something. Do you really want to hit that link, or look at that picture? Is it worth the time it will take for the browser to load, then load the page? This is the first phone I've owned where even not on WiFi, I simply don't have to think. Just tap any link and it loads in seconds. It's amazing. The phone I was coming from was anything but slow, too. I didn't make a quantum leap in phone processing power, but the Nexus 4 is just that fast. 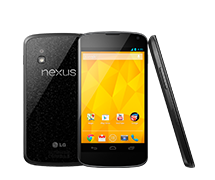 The Nexus 4 coupled with T-Mobile's $30 unlimited no-contract plan (sign up using this link and we both get $25), and you're going to be sitting pretty. And the money you save on your phone bill will pay for the Nexus in short order. There are also a few things I want to note about the update from Android 4.1 to 4.2, but that's for another blog post. Look for that in the future. Overall, it's safe to say that this is the best phone I've owned. I've felt that sentiment before, as I'm sure many of you have. The new phone is always the best ever when you first get it. But this time it seems different. I've been using smart phones since the original XDA, and there aren't many times I can say that I've noticed this kind of improvement from old phone to new. Bottom line: the Nexus 4 won't disappoint. I highly recommend it.